With over 75 years of combined experience and upwards of $75 million recovered, The Barrera Law Firm knows what it takes to win you the compensation you deserve. Handling Cases in Virginia, Maryland, & Washington D.C. There is nothing more distressing than experiencing an injury as the result of someone else's recklessness or oversight. Depending on the extent of your injuries, you may be unable to work for some time. You and your family should not have to deal with the financial repercussions of an accident you did not cause. If you are facing this kind of stressful situation, you have come to the right place. 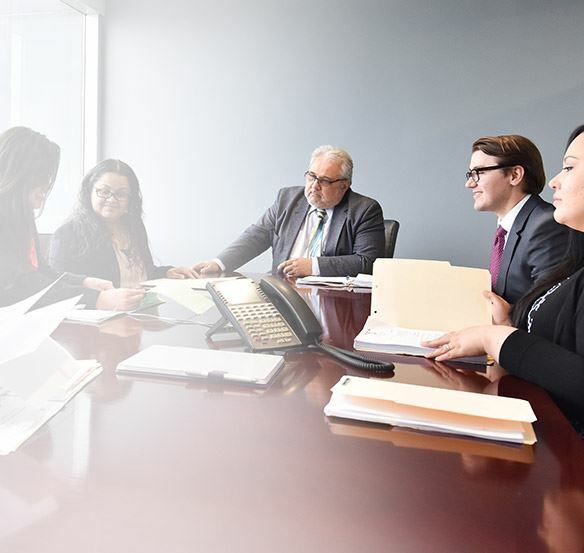 At The Barrera Law Firm, PLLC, we have represented thousands of injured individuals and helped them obtain the compensation they need and deserve. Whether you are located in Virginia, Maryland, or Washington D.C., we are ready to help you, too. Don't Wait to Get Help. Contact Our Firm to Schedule a Free Consultation Today. Just so the record is straight, there is another firm who advertises that they settled a $3 Million dollar Virginia Workers’ Compensation Case on behalf of a brain injured worker. So that that there is no confusion or misrepresentation, Daniel Barrera was the lawyer who singlehandedly obtained that $3,000,000.00 Virginia Workers Compensation Settlement. In fact, Mr. Barrera has obtained over $1,000,000.00 for his clients on six separate occasions. This was a long-term disability case in which my client had been forced to stop working due to the consequences of having a large tumor removed from their brain. This person had suffered neurocognitive deficits as a consequence, often forgetting things and being more emotionally susceptible. Though my client had received benefits since 2006, the insurance company never stopped trying to get rid of them. Their benefits were terminated years ago, and they overcame that hurdle. In January 2016, their benefits were terminated again. They turned to us. The insurer denied benefits this time because: they claimed my client stopped taking their meds; they claimed my client was neurologically fine, and; they claimed my client’s problems were related to an eye condition. My client was still taking their medicines; they had just changed to an online pharmacy. An understandable error by the insurer. Their claim that my client was fine neurologically was fictitious. Absolutely fake. We know this because there had been 8 previous neuropsychological examinations. All unanimously agreed our client was disabled for life. One mentioned a possible eye problem, but that was summarily disproved. In short, the insurance company denied benefits without any supporting evidence. It created tremendous stress in their life for 10 months while we got the situation sorted. Before the deadline even came up, the insurer reinstated benefits, no additional questions asked. They were handily defeated. My client was very fortunate to have the unanimous support of their family and husband, all of whom helped to put together hundreds of pages of supporting documents for their appeal. Our client is on track to receive more than $1,406,000 in benefits while she remains disabled. We were able to obtain a $625,000 settlement following a day long mediation for a client who injured his shoulder after falling high up. He had multiple shoulder surgeries following this severe accident. The client had previously received $190,000 from Workers’ Compensation for the same injury, plus $110,000 in lost wages and $170,000 in medical treatment, bringing the total amount paid out on his behalf to roughly $1,095,000. This is a very odd story of a man who was injured by a rock. While pushing a wheelbarrow, our client fell over a large rock, landing with his back directly on a pointed rock which injured his spinal cord. He went to the hospital and was released. He returned to the hospital 5 days later with a temperature, but was again released. He returned a third time shortly thereafter, and this time the doctors realized there was a serious problem. By this point, he couldn’t walk and had trouble urinating. It turns out there had been an epidural abscess exerting pressure on his spinal cord. This abscess had gone undiagnosed for days, wreaking havoc on his spinal cord. Our client, as a consequence, still cannot walk to this day. We alleged that this was medical malpractice, and were able to help secure a settlement for our client in the amount of $1,050,000. Our client was a paver who was run-over by a co-employee while helping a paving milling machine mill the road. The machine amputated his leg below the knee. Because of the client’s low wages, under Virginia law, the maximum value of his leg was only $75,000. We got him $250,000 on top of the $500,000 paid for his medical expenses and the $55,000 in lost wages he previously received. Our client was T-boned in a gruesome Fairfax County accident, which led her to receive $210,000 in medical treatment. She elected to settle her case for $710,000. We are very happy she recovered well and she was very happy with the outcome. This case was a worker’s compensation claim. Because it is ongoing, we cannot mention any names. What is important to know is that our client was painting a roof when he touched an electrical wire, and was electrocuted off the roof, falling to the ground below. As a consequence, he suffered severe burn injuries to the majority of his body and fall injuries. He accrued over $811,000 in medical bills. Because he didn’t initially have an attorney, the hospital had billed Medicaid for $50,000 of the coverage, and gave up on the rest. However, that wasn’t very fair. Taxpayers shouldn’t have to pay for what workers compensation insurance is supposed to cover. Hospitals and doctors shouldn’t lose money on a case so an insurance company can profit more. So we set about getting that hospital paid for their valiant, lifesaving efforts. Recently, we convinced Medicaid it didn’t have to pay that $50,000. We also convinced the insurer to pay more than $700,000 to the hospital for past services rendered. Our client was extremely happy his doctors were paid! This is a truly sad story. Our client was attacked by a hammer-wielding-assailant while working at the outlet mall. It turns out he was targeted because of a past relationship with his assailant’s current girlfriend. The assailant used the claw-side of the hammer to puncture our client’s spinal cord in a dressing room ambush. Our client was left with no recourse and no legal way to obtain compensation for his claim. He wasn’t targeted because he was an employee of a store, he was targeted because of his life outside of work. Because of this, he claim wasn’t covered by Workers’ Compensation. However, in spite of that, after long negotiations we were able to obtain $588,500 in lifetime payments to our client as a settlement of all claims. In spite of having no legal way to win, our client still got something for all the trouble he has, and will continue to, endure. 6 passengers inside a work van were t-boned and flipped in a Virginia accident. The workers inside were each injured to different extents, ranging from quite serious to just a scratch. Between all of them, $375,000 was paid out. Some received as little as $2,000 for their scratch, while the most seriously injured received almost $200,000. Our client was a window washer who fell from the 4 th floor when his harness broke. He subsequently broke a bunch of bones, but made a great recovery. Following a long fight, the client won $220,000 in medical treatment to help him recover and an additional $120,000 for the injuries to back. Boasting more than 75 years of legal experience across VA, MD, and DC our accident attorneys in Virginia has the solid legal insight and resources to handle the most minor and complex cases. Dedicated to the practice of personal injury law, we represent individuals injured in auto accidents, motorcycle accidents, trucking accidents, bicycle accidents, and construction accidents. If you have lost a loved one due to negligence, we can also assist you in filing a wrongful death claim on their behalf. With our help, you may be able to receive the compensation you need to pay for all accident-related costs, such as medical care and lost wages. Our client-centered, hands-on approach will put you at ease. You focus on recovering, while we put our experience to work for you. Our firm's founder is a seasoned trial lawyer with more than 100 trials under his belt. What does this mean to you? It means that should your case go to trial, you can feel at ease in knowing that your rights and interests will be protected by a proven litigator. We are the kind of law firm you need at your side, inside and outside of court. Obtaining the maximum amount of compensation possible for our clients-this is our ultimate goal. This unmitigated dedication has led to countless successful results. In fact, we have gained inclusion into the illustrious Million Dollar Advocates Forum® for having won substantial settlements on behalf of our clients. We also help injured workers petition for the workers' compensation they need after experiencing an injury while on the job. We do everything possible to help injured workers get back on their feet. Virginia injury laws place strict time limits on when you can file an injury claim. Don't wait any longer to act! Contact The Barrera Law Firm, PLLC today to schedule your complimentary case review. We're here to listen 24/7.